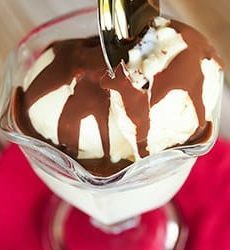 An easy recipe for homemade chocolate magic shell - the two-ingredient ice cream topping that hardens as soon as it hits the cold ice cream! Microwave the chocolate and coconut oil in a 2-cup measuring cup or small bowl at 50% power until completely melted, stirring every 30 seconds. Allow to cool to room temperature before using. The magic shell can be kept at room temperature, in a covered container, for up to 6 months. Stir (or shake gently) before using. Note: Refined coconut oil is recommended, as it has a neutral flavor. You can use unrefined coconut oil if you wish, but it will impart some coconut flavor.